One of the most special times of day in Istanbul is breakfast. It’s a ritual, a way of life, and definitely not only for Sundays. A beautiful Turkish breakfast can happen any day of the week, and you can find one anywhere in Istanbul. Wherever there’s a cafe, there’s breakfast. What makes Turkish breakfast different is the diversity of the food that comes to the table. From different types of cheeses and breads to eggs and jams, breakfast in Turkey is nothing short of a feast. Even when my family and I are just visiting Istanbul, we often purchase our own supplies and make this breakfast at home. 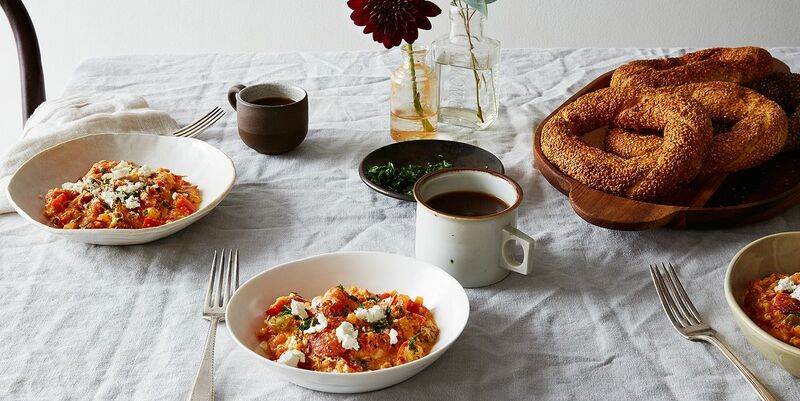 Having kept an apartment in the city, which we’ve been visiting regularly for almost seven years, making a Turkish breakfast spread comes naturally to us—which emphasizes how easy it is to throw together at home. Simit is probably the most important bread that comes to the table. It’s shaped like a ring and covered in sesame seeds. Crispy on the outside and soft on the inside, simit is a staple of any Turkish breakfast. Beside simit, you can also find pogača, which are single rolls stuffed with different filling such as cheese and cooked potatoes. My favorite kind is the dill and white cheese (feta cheese) pogača. Acma is another type of bread that’s commonly served in Turkish breakfasts. It’s usually made plain or stuffed with black olive spread or chocolate. Alongside these special breads, you can usually find plain white and whole wheat bread as well. On top of all of these, a common breakfast item is also börek, a savory pastry item made with layers of yufka dough and cheese, ground beef, spinach, or potatoes. Börek itself comes in many forms: sliced, rolled, or even shaped as a triangle. Turks have börek any time of the day; it’s not solely a breakfast item. They usually enjoy it with a small glass of tea. The diversity of cheese in Turkey always amazes me. You’ll find at least three types of cheese on any breakfast plate. Each town and city has its own cheese that’s made from sheep, cow, or goat milk. Textures differ from super creamy and soft to very hard cheeses—there’s a little something for everyone. Basic white cheese called beyaz peynir is the most common breakfast cheese, which can be soft and creamy or quite hard with less fat. Other common cheeses are kasseri, which is a semi-hard cheese made from unpasteurized sheep milk, and çeçil peyniri, which is stringy with very little salt. My favorite Turkish cheese is Ezine peyniri, a white cheese from Ezine, a town in western Turkey. Olives, cucumbers, and tomatoes are always present on the Turkish breakfast plate. They’re usually drizzled with extra-virgin olive oil and topped with some dried mint. Turkey has some of the best olives I’ve ever tasted. There are so many varieties of green and black olives, and the best thing is that most shops let you sample all of them before buying. Turks love fresh tomatoes and cucumbers with cheese and bread in the morning—as do I, since it’s so close to what we have for breakfast in Iran. Sahanda yumurta, aka fried eggs, are a common breakfast item. They’re usually made in small copper pans. But sucuklu yumurta (eggs with sucuk) is an even more popular dish. Sucuk is a dry beef sausage that’s quite spicy and pairs perfectly with fried eggs. I usually don’t use any oil to fry sucuk because I want the pieces to release their fat, which make the eggs so delicious. The yolks are usually runny, and I love dipping a piece of simit in the egg yolk. Another common egg dish is menemen which is basically eggs, fresh tomatoes, green bell peppers, and onions all cooked in a pan and seasoned with salt and pepper. It’s served warm, usually straight in the pan, into which you dip bread. From strawberry and raspberry jams to apricot preserves, you can find so many different variations of fruit spreads at breakfast. My favorite is tahin pekmez, which is essentially tahini and grape molasses mixed in a bowl. I like a 1:1 ratio, but you can modify the ratio to your liking. There’s also a savory black olive spread that I love for its spreadable consistency and unique flavor. Tea is an ingrained part of Turkish culture and Turkish identity. And it can be found everywhere: in restaurants after each meal, on the ferry when you’re traveling from the European side to the Asian side, in the bazaar, and in every shop while you’re waiting for the shopkeeper to bring an item for you. It’s always served in a gorgeous small glass with a curve in the middle (so you can hold it easily). Somehow those of us from the Middle East are capable of holding this hot glass of tea in our hands without burning ourselves, which I suppose comes from within. Turkish breakfast is a lifestyle. It’s where many important conversations happen, from business talks to marriage proposals. It all happens over simit, cheese, and tea. Maybe it’s the diverse flavors of the fresh food, each bite inviting you in for another, which means prolonged quality time spent at the table with whomever you’re sharing the meal with. It is, for me, about sharing what’s at the table, including what’s in the heart. What’s your favorite part of a Turkish breakfast? Tell us in the comments below! > What Do We Do Now That Will Be Unthinkable in 50 Years?